This past week our company had it’s annual picnic. There was much food and games and drinks all around. One of those events was a root beer tasting which I hosted at their request. I decided to present all Seal of Approval brews with different flavor profiles to highlight the breadth of the gourmet root beer world. My choices were limited to availability, but I settled on 6 different varieties to be tasted in pairs: Hank’s and River City, nice smooth brews with rich flavors. Sparky’s and Spring Lake (local) which are complex and spicy brews, and Hosmer Mountain Sarsaparilla Root Beer and AJ Stephan’s Butterscotch Root Beer, flavored root beers. Unfortunately I had to cut it down to only four and two of them weren’t available in the needed quantities anyways, so I went with Hank’s, AJ Stephans, Sparky’s, and Spring Lake. I was curious to see what everyone thought so I made score cards for everyone to fill out if they wanted, with rankings 1 to 10. I wanted to collect age and gender, so I could do a demographic breakdown, but HR wouldn’t let me. Nevertheless I got some good data which I have analyzed with the same rigor of any technical paper I’ve ever written and present here. A total of 69 score cards were filled out of an estimated 100 people that came through to sample root beer. 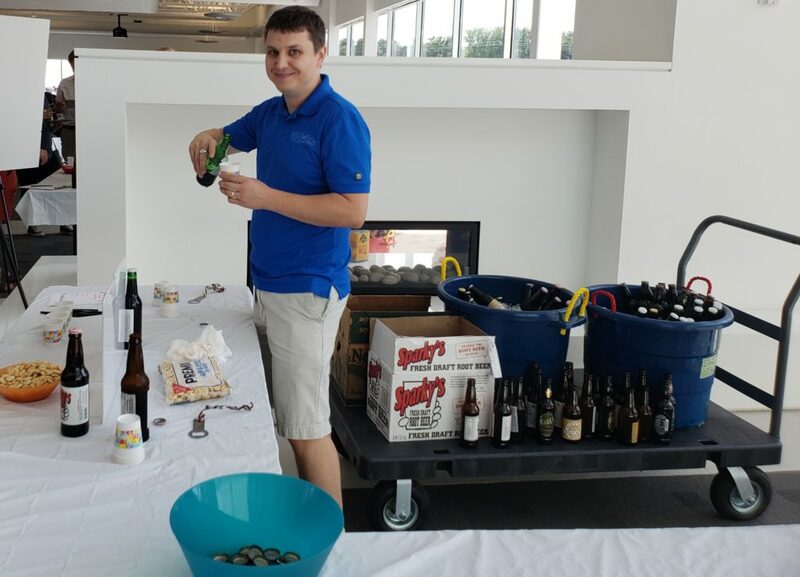 There were approximately 500 people at the party but the root beer tasting was the furthest activity from the food and other child friendly activities so that may have contributed to the lower than expected turnout. While the time of that the score card was filled wasn’t recorded, they were stacked in order, (with the exception of a certain director who wanted to purposely skew the results and put her score card in the middle of the stack (you know who you are)), and thus the time of the testing can be approximated based on the fact that the tasting was run for 2.5 hours with a fairly uniform distribution of patronage over that time which gives approximately 2.2 recorded samples per minute. A summary of the results are shown in Table 1. It can be seen that Hank’s was the most popular root beer. It not only has the highest average score but it has the highest minimum score, which means it wasn’t ever disliked as much as the others. It also has the lowest standard deviation, meaning that it was more consistently given high scores. The second most popular was AJ Stephans, followed by Spring Lake, and then Sparky’s. 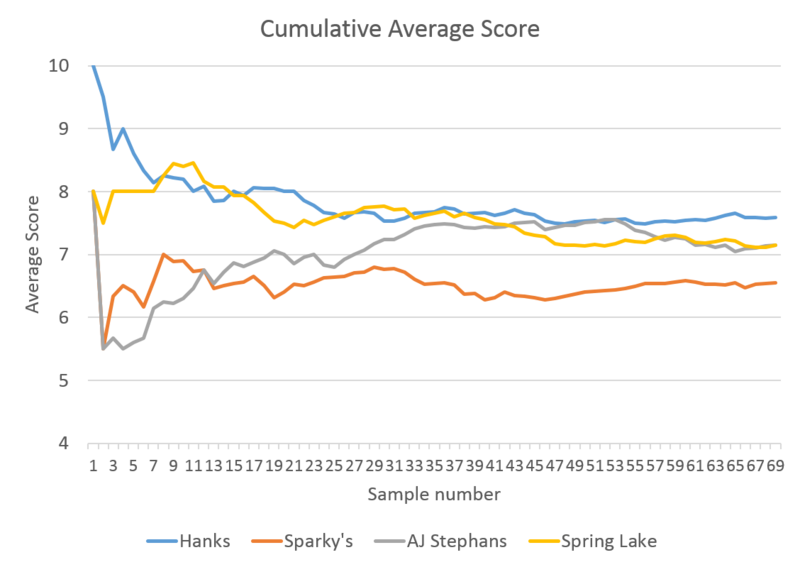 The standard deviation of the scores of AJ Stephans was significantly higher than all of the others, showing that opinions of a butterscotch root beer varied strongly. Spring Lake’s only slightly lower score was more consistent. A histogram of the frequencies of the scores received by each root beer is shown in Fig. 1. and a radar plot illustrating those score distributions is shown in Fig. 2. Fig. 2. 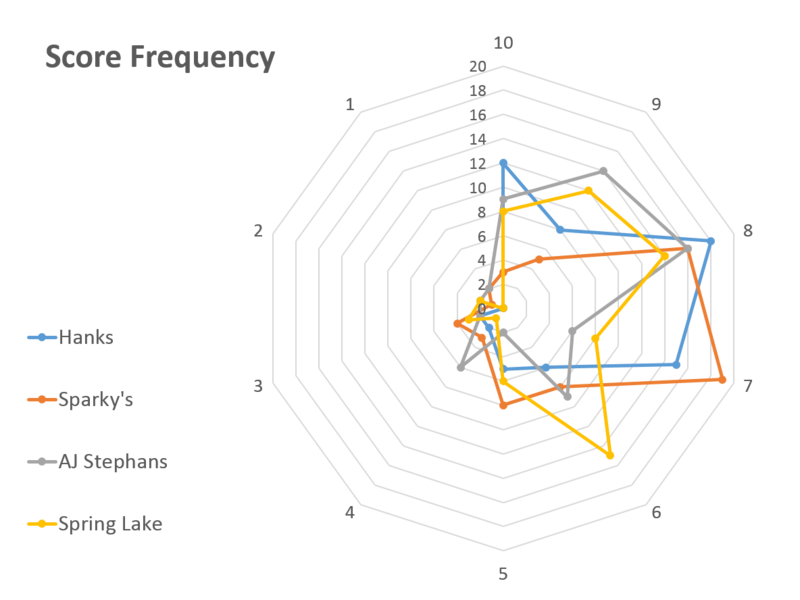 Radar plot showing the distribution of score frequencies. It can be seen from these two figures that Hank’s had the highest number of perfect scores awarded and the the most scores from 8 to 10. AJ Stephans had the second highest number of 10’s, but also the lowest number of 7’s and the highest number of 4’s, and tied for the lowest number of 2’s, and 1’s which reinforces that people either loved the butterscotch flavor or hated it. Another interesting analysis is that of how the scores changed over time. A 10-sample (~5 minute) moving average scores are shown in Fig. 3. and the cumulative average over time is shown in Fig. 4. It can be seen in Fig. 3. that though Hank’s was consistently near the top, there were many periods in which other root beers were receiving higher average scores, most notably Spring Lake at the beginning and AJ Stephans near the middle. Fig. 4. reinforces this. 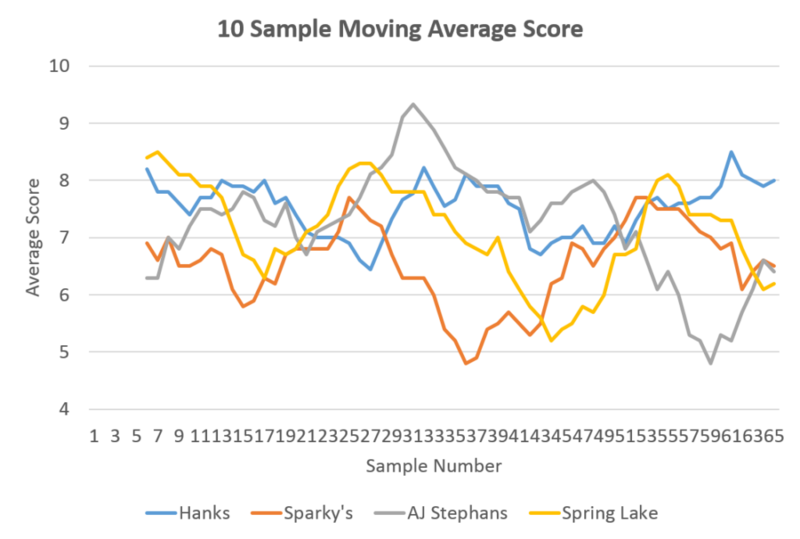 There it can be seen that while Hank’s initially starts with the highest average (my scores, corresponding to their keg ratings, were the first given) drops early on with Spring Lake being the more popular root beer by the end of the first quarter of the tasting. Throughout the second quarter, Hank’s and Spring Lake alternated between first and second several times. 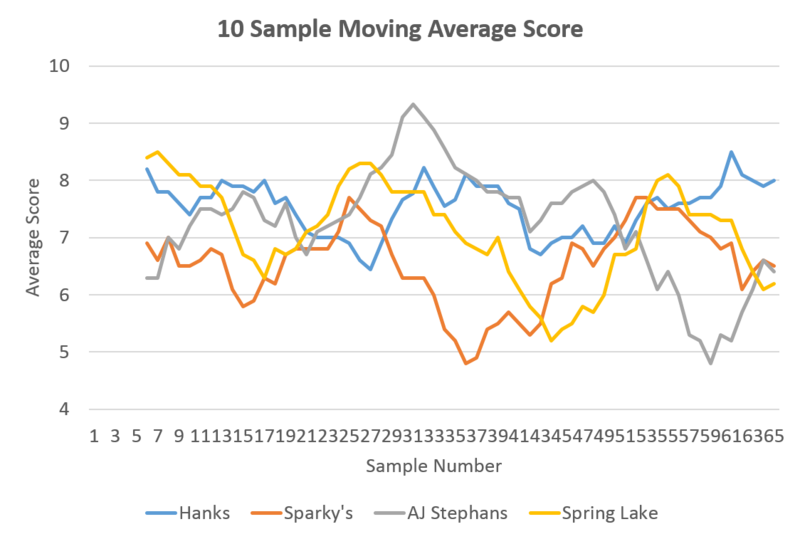 After half of the tasting was over, Spring Lake’s popularity dropped significantly while AJ Stephans rose to at a single sample period it took the first place spot before dropping down. Spring Lake overtook AJ Stephans at the beginning of the final quarter, but then fell to the third ranking at the very end of the tasting. After the first quarter, Sparky’s was in a consistent last place. Fig. 3. A 10-sample (~5 minute) moving average of scores. Fig. 4. Cumulative average score of each root beer over the course of the tasting. Several aspects of these scores merit additional discussion. The first is that the average scores of all of the root beers are below the 8, which corresponds to my cutoff for a Seal of Approval. A likely reason for this was the lack of average or bad root beers in the testing. If they are all high rated root beers to begin with, someone unfamiliar with the broader root beer world would likely lack a proper frame of reference. Another point to address is that of Hank’s being the only “typical” root beer. This is a fair point of contention, as Hank’s was the only root beer that would fit that description. Though not by design, as River City would be considered within the mainstream root beer flavor spectrum, this could explain the lower variability in the scores of Hank’s compared with the others. The much higher variability associated with AJ Stephans is fits this hypothesis as it was the most atypical root beer flavor. Additional research is required to determine if this universally applies to root beer scores given by the general populace. Nevertheless, when compared to recorded reviews of root beer bloggers, those who are more familiar with full spectrum of root beer flavors, Hank’s performs as expected, consistently liked. This post has presented the results of the recorded scores from the root beer tasting event at my company summer picnic. 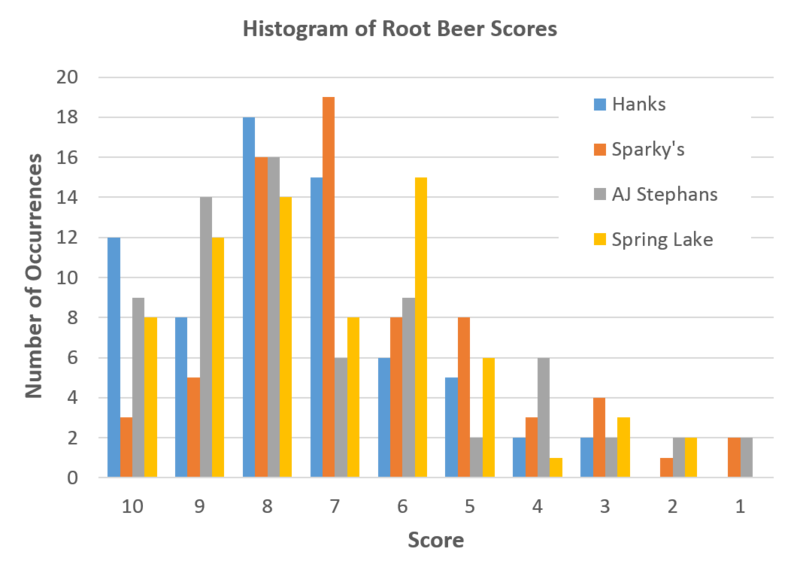 Of the four root beers tasted, Hank’s, Sparky’s, AJ Stephans Butterscotch, and Spring Lake, Hank’s had the highest average score, highest minimum score, most perfect scores, and lowest standard deviation of scores. From this it can be concluded that Hank’s was the most popular root beer at the party. 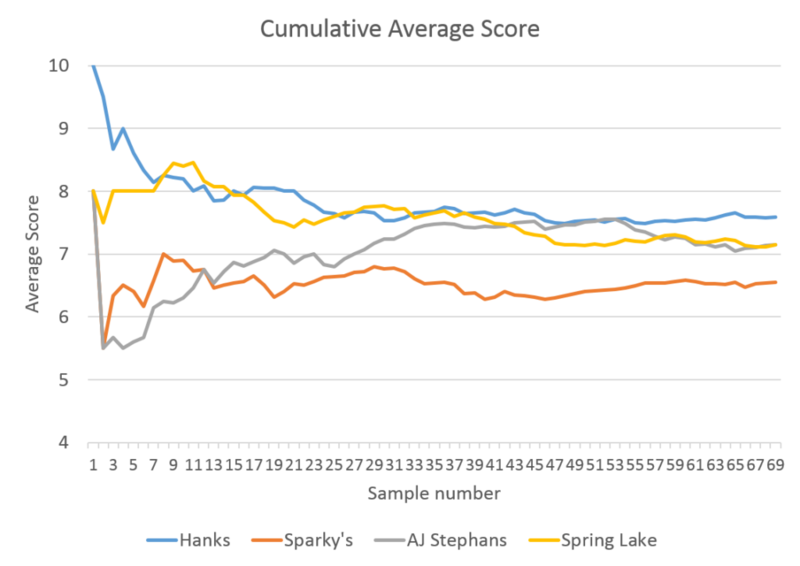 The second most popular by average score was AJ Stephans Butterscotch, but the close 3rd, Spring Lake, had more consistent scoring and a higher minimum score, so it can be argued that it is a tie for 2nd place, depending on the metric used. Sparky’s root beer was the least favorite at the tasting. However, all of the root beers had an average score greater than 6/10, so in general all of the root beers were considered above average.